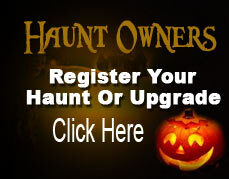 Central Ohio's Longest Running Haunted Attraction. The Pataskala Haunted Forest is Central Ohio's longest running haunted attraction! We are a 30-45 minutes trek through the pitch black woods. The Pataskala Haunted Forest is located on the Old Murdock Land in Pataskala, Ohio. Over 200 years ago, Prior to the first settlers coming to the area… The Murdocks were already there. Lead by Jebidiah Murdock, The Murdocks don’t take to kindly to trespassers on their land. Many come to find out their secrets, fewer live to tell what they have discovered. The Pataskala Haunted Forest has been a haunted attraction dating back to 1989 in Pataskala. The haunt is completely operated by volunteers and the profits made directly go to the Pataskala Lions Club & Southwest Licking Youth Football & Cheerleaders. Every Friday & Saturday in October. Due to some gore, special effects, loud noises and intense acting it is not recommended for small children. We have had young children go through and have a great time and adults who go through and are in tears. You're the parent, you be the judge. then turn East on Refugee. and then East on Refugee. Signs are posted in the area. $2.00 Off Admission Coupon available on our website!